Food festival takedown: These vile bacchanals are a waste of money. These modern-day bacchanals showcase the worst features of American life. At the touring piggypalooza Cochon 555—which bills itself as “an epic porc feast featuring top chefs preparing whole heritage breed pigs”—tomato-faced diners cut lines with impunity. When necessary, they use sharp elbows and shoulder shivers to establish position. Their eyes scan the chefs’ tables frantically, and their shaky hands seize each tiny cup of tortellini en brodo before the tray touches the tablecloths. If you close your eyes and listen, you hear exaggerated groans of pleasure and thumping feet colliding eerily with glugs, scrapes, and clangs. Looking down from the relative safety of a balcony at the L.A. House of Blues, where I was researching a blog post for L.A. Weekly last year, I was reminded of the end of Nathanael West’s short 1939 novel The Day of the Locust, in which a horde of spiritually famished L.A. grotesques, urged on by a gleeful barker, turns violent and destructive at a movie premiere. 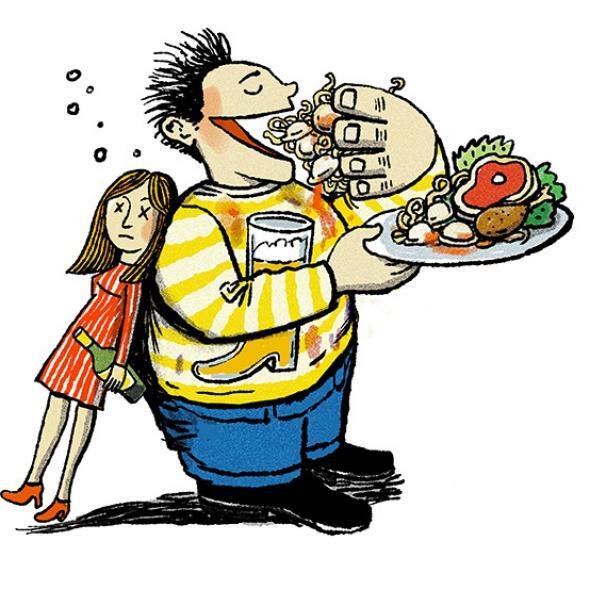 A celebration of eating turns strange and a little horrific when the overeaters-next-door are so caught up in their pursuit of porky goodness that they eschew manners and propriety, stirred by a barker’s exhortations and emboldened by their anonymity. A food festival is a good way to lose your appetite, even if you’re attending, as I have on half a dozen occasions over the past five years, in a semi-detached journalistic capacity (usually writing for a Village Voice Media food blog). These festivals, whether food truck showcases or judged cooking competitions, are not concerned with creating a sense of community. They may even obscure the artistry of the participating chefs. They proudly revel in the relentless, boorish stuffing of faces, unchecked public intoxication, and wasteful excess. Cochon 555 is not an outlier. It exemplifies the trend. At the 2013 Los Angeles Street Food Fest, for instance, eaters who had paid $75 for the occasion gathered outside the gates of the Rose Bowl. Some carried plus-sized versions of the cardboard boxes that In-and-Out uses to serve large orders. Within a few minutes of entering the arena, those cardboard troughs were stretched to their splitting point, inside each, a United Nations of incongruous foodstuffs: Thai noodles, pastrami, cheese-smothered waffle fries, a pizza sliver, half a dozen tacos, a medium-rare slider, and pork belly sandwiches with pickles. There are a couple of strategies for navigating a food festival of this magnitude, both equally unappealing. If you heap your cardboard box with food and then find a place to huddle and eat, you end up forgetting the ingredients and provenance of each selection. Your food may be cold. It may have all spilled together, which is fine if you’re eating mashed potatoes and peas, but less so if your pig skin pasta is exchanging fluids with the sausage-stuffed squid braised in black ink. If you eat as you go, you’re standing up the whole time, in digestion-thwarting motion, balancing drinks, and dodging fellow patrons, who think nothing of spilling Anchor Steam down your leg or haphazardly flinging guacamole on your shoes. Indoors, space is inevitably limited. You can’t rest a tray anywhere that isn’t precarious. Outdoors, the sun gives the food on your plate an unappetizing glaze and blisters your skin like pizza cheese. There’s also the problem of avoiding inebriates. Food festival attendees drink with the giddiness of college freshmen finally free of controlling parents, and wineries, breweries, and distillers give away their wares for free in exchange for exposure. At the L.A. Street Food fest, most diners held at least one cocktail or tall, perspiring cup of beer in the hand unoccupied by the trough. Unsurprisingly, given the heat and the frequency with which they returned to the vendors, many were done by late afternoon, either bulling zombie-like from line to line or literally falling asleep. Couples slumped on benches, their troughs half-empty. Dropping her drink, a woman passed out against a wall, and festival employees rushed to revive her. Some food festivals trumpet sustainability as a pillar of their mission, but this is self-evidently ridiculous. While biodegradable forks made from potato starch are popular, at the end of the day, napkins, plates, and discarded food billow out of garbage cans. Piles of trash sprout wherever attendees feel like starting them. Just because the heritage-breed pigs everyone’s tucking into were raised on chestnuts, doesn’t mean that the event is somehow expanding the crowd’s understanding of food systems. Responsible animal husbandry is great, but the very notion of encouraging a few relatively privileged people to dramatically overindulge—and then leave piles of garbage behind for janitors to clean up—seems unsustainable. Walking out of a food festival, I feel bad. I have eaten too much good food, but I don’t feel the warm glow that accompanies an opulent, booze-soaked dinner party with friends or a restaurant splurge with a partner. Instead, there is the queasy guilt that I have not enjoyed with the appropriate reverence a luxury so many others cannot fathom. Relax, some might say. Why be indignant about the obvious? Food festivals are supposed to be messy bacchanals. You pay for the privilege of sampling a variety of wares, being a part of the scene, and letting yourself go. Music festivals are an easy comparison: At a major food festival, you can enjoy the cooking of many of a city’s best chefs in an environment hardly conducive to eating, and at a major music festival you may enjoy performances by dozens of popular artists in an environment ill-suited to appreciating music. People have a special relationship with music, but enjoying music isn’t an essential activity the way eating is. The pursuit of sustenance is part of survival, and cooking, many have argued, is quite literally what makes us human. Meals are sociocultural rituals; dinner tables strengthen bonds of family and friendship. A splashy food festival free-for-all encourages you to bypass all of that. And that, I believe, is precisely why some people like them. The ritual of eating a meal, whether at home or in a restaurant, is smashed. The community that naturally forms around food preparation and consumption is replaced with an artificial one lacking a communal spirit. At dinner, you share conversation and pass dishes. The meal is (ideally) improved by the company. People (hopefully) try not to revolt one another. At food festivals, those that make up the community have self-interest perpetually in mind. They don’t consider how their actions affect others. They talk to those with whom they came, sure—while standing and scarfing—but above all they pursue individual satisfaction. Get ahead in line. Get your money’s worth. Grab (literally) a piece of the pie before it’s too late. At a big, bombastic food festival, everyone walks in with the same ticket, but only selfishness and a willingness to be brash, bold, and a little idiotic will get you what you covet. It’s a brined and barbecued version of the American Dream. And like the original, it can leave you feeling empty.